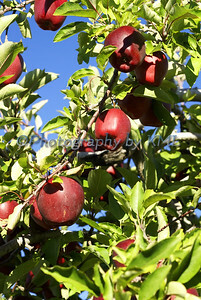 One of my favorite places to visit in the autumn is the apple orchard. One is completely surrounded by the aroma of fresh apples. The tree branches are heavy with them and they all are very tempting to pick. Each one perfectly grown and they do taste the best when just picked from the tree. The orchard we visit is on top of a hill that has beautiful views of the distant mountains - they even have a map that names each of the peaks for those curious visitors. I have never been in the springtime, but that orchard must be something to see with all those apple blossoms on the trees! Marigolds are always a bright spot of color in the garden and I like to include them each year in mine. I have never purchased them as plants because they are so easy to grow from seeds. And the seeds are much cheaper than the plant flats. They have a slight smell to them, but nothing as grand as the roses or lilies. It isn't Marigold season here yet, but I do have my seeds already and they will go in the ground at the beginning of next month. Spring is slowly making it's way to New England this year, and it's arrival is most welcome! We still have quite a covering of snow in our area, but in another month and a half or so, these little beauties will be making their appearance. I always look forward to finding them as we walk along our road. Each year there are less and less, though, as they are a very delicate bloom that only grows in specific conditions which are fast disappearing. There is one particular spot that they grow without anybody bothering them, and I take in their beauty as we drive by along the highway. Stopping to admire them is difficult in this spot and I wouldn't want to draw too much attention to them from the passers-by. 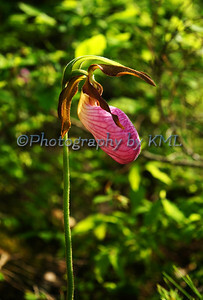 I have loved them ever since I was a little girl, and they always bring such joy each spring, these pretty little Pink Ladyslipper Wildflowers.